Recently, we had an interesting case with one of our clients where he always needed to exclude different locations from his AdWords campaigns based on the business availability. This used to happen very often and the client used to come back to us every couple of days asking to exclude and include different certain locations. Excluding dozen of locations actually takes time and mistakes can happen, so we had to think of a way to automate this process. 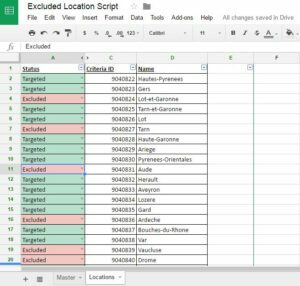 We developed a simple AdWords script linked to a Google spreadsheet where the client can just change the status of his locations to “Excluded” or ” Targeted” and changes will be applied to the campaigns. #1 The Locations Sheet where we list all of the available locations supported by the client business along with their IDs. #2 The Master Sheet where we only pull the excluded locations from the location sheet (using an array formula) and feed them into the script. The first thing the AdWords script does, it removes all the excluded locations from the specified campaigns. So, if the client does change the status of any of the locations from “Excluded” to “Targeted”. We make sure this is also applied through our script and we target the location back again. The script then starts iterating over the data in your spreadsheet and if the location column is empty it stops executing at this point. 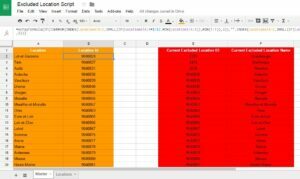 Otherwise, the script will finish its job and exclude all the locations added in your sheet from your AdWords campaigns. Finally, the AdWords script gives you a report of all the excluded locations in your campaigns or across your account. You can find the report in your sheet in columns “E” and “F” in the master sheet. Also, don’t forget to schedule your script to run every 24 hours or the time period that suits you. So, whenever a change happens in the spreadsheet, it applies to your AdWords campaigns. Here’s the source code of the full AdWords script. You can make a copy of the spreadsheet and start testing it out on your account and let us know how it goes. Please make a copy of this spreadsheet and add all your locations (the name + the id). You can download a list of the location names + the ids from here. same problem! I already set up the lcoations! 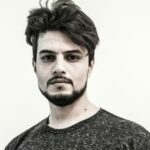 Are you targeting Argentina as a country in your campaigns? If no, you should target the entire country and will be excluding the cities separately. I tried to run the script again and it’s working for me. Please give me edit access to your spreadsheet and share with me the script after your modification and will try to run it on my accounts.